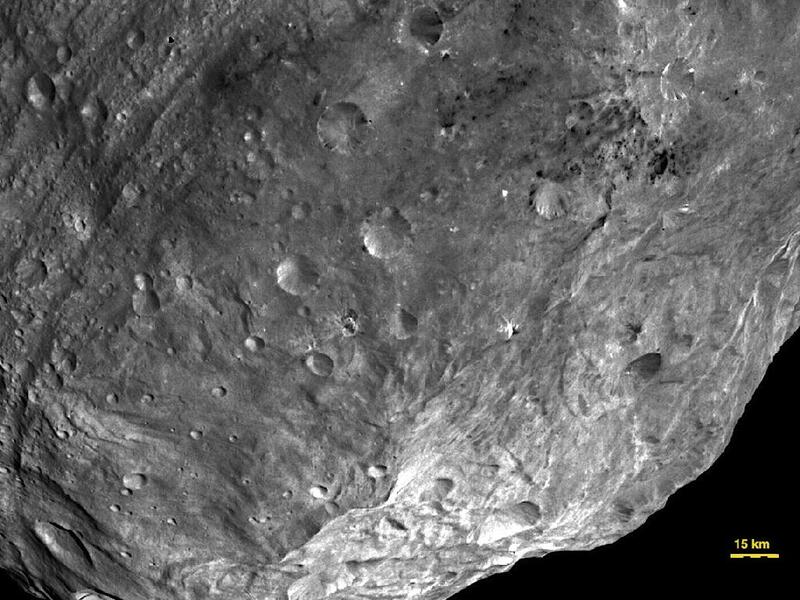 This image of Vesta was taken by the Dawn spacecraft from an altitude of 3200 miles above the surface. Dawn is a part of the Discovery program managed by the NASA office in Huntsville, AL. UCLA is responsible to the scientific portion of the mission. The autumnal equinox is on Friday, September 23rd. And in this equinoctal month, most of the bright planets cluster around early evening or post-midnight. In the dusk sky, Saturn disappears in the twilight over the course of the month, while Venus moves up away from the sun by month’s end. On September 29 they’ll be only 1.3 degrees apart: catch them early in twilight, before they sink too low. Jupiter rises around 10pm early September, a couple of hours earlier by month’s end, so it’s still best viewed after midnight. Mars and (in the first half of the month) Mercury are visible in the predawn sky. Neptune, in Aquarius off the left tip of Capricornus, is just past opposition and well placed for observation this month. Uranus, a couple hours behind it, reaches opposition on the 25th, standing all by itself in a sparsely populated area of Pisces. Fortunately, Uranus is bright enough that it’s relatively easy to find. There’s something besides Uranus at opposition this month. Asteroid (1) Ceres, our largest asteroid, reaches its opposition on the 16th. While Ceres isn’t normally a major target for amateur observers, the NASA “Dawn” asteroid mission has been in the news lately. Not for Ceres – Dawn won’t get there until February of 2015 – but because it reached orbit around another asteroid, (4) Vesta. And both asteroids are visible this month. Vesta, the brightest asteroid, is about 2 degrees northwest of the bottom of the Capricornus “smile”. Start at the bottom point of Capricornus, Omega Cap, then go up and right (northwest) a couple of degrees to a 4th magnitude star, Psi Cap. From there, magnitude 6.25 Vesta is a quarter of a degree south-southwest. There are no other stars that bright nearby, so Vesta should be an unusually easy shot, and fun to observe at the same time Dawn is observing it. Ceres is quite a bit harder. First, it’s far away from anything, off in the western reaches of Cetus. There is one 4th-magnitude star half a degree to the west-northwest that might help you locate Ceres – XEphem calls it Cetus 6, or HIP 910. But a second reason Ceres is difficult is that it’s much fainter than Vesta, at magnitude 7.8. Why is that, if Ceres is bigger? It is indeed much bigger – 950 km in diameter to Vesta’s 530. But Ceres is very dark, with an albedo of only 0.09. Albedo is a measure of surface brightness, without taking size into account. For comparison, the moon (made largely of dark basalt rock) has an albedo of 0.12, and charcoal’s albedo is 0.04. So 0.09 is quite dark! Vesta’s albedo, on the other hand, is 0.35 – very close to the Earth’s average albedo, with all our blue water and reflective white clouds. So Vesta is quite bright – making it the only asteroid which is sometimes bright enough to be seen with the naked eye. And that’s why it’s a much easier target for observation than its big sister Ceres. An easy answer – but now you may be wondering: why is Vesta so bright and Ceres so dark? And I tried to find out – but nobody seems to know, or even to ask the question. Vesta is mostly basalt, while Ceres is a carbonaceous chondrite with a bit of a reddish tinge. Both types of rock are normally fairly dark: basalt is your typical Hawaiian volcanic rock, rather like dark asphalt. Carbonaceous chondrites are a little less common, but you may have seen some as meteorites at the last SJAA auction. Even stranger, Ceres is thought to perhaps have water in its interior, and a hint of an atmosphere. The more I read, the more evidence I see that would lead me to expect Ceres to be the brighter one. So how does basaltic Vesta manage an albedo comparable to our bright Earth? Is its regolith – the fine soil created by constant bombardment with micro-meteors – full of glassy particles that reflect a lot of light? But that’s true of the moon, too, and the moon’s albedo is nowhere near Vesta’s. It’s an interesting mystery, and the first batch of Dawn images – which show a wonderful, moon-like cratered surface – don’t offer any obvious answers. I’ll be watching the Dawn results with interest.